in Mobile Marketing, Social Media with tags #Dieselreboot, #mamming, Android, app, Breast Cancer Awareness Month, Diesel, Facebook, Mixhibit, mobile app, Smirnoff, twitter, VH1 Both comments and trackbacks are closed. This week brought Facebook privacy setting updates for teens on Facebook, some new apps from Smirnoff and VH1 as well as the launch of #Mamming, a new campaign that’s raising massive awareness for Breast Cancer Awareness Month. Facebook updated its privacy settings for teens (defined as users aged 13 to 17), now allowing them to post publicly and gain followers. This demographic, which encompasses a large percentage of Facebook users, can now share updates with people outside of their immediate circles— with the option to even make their posts visible to everyone on the site. With recent debates as to whether Facebook is losing its cool-factor among young people, the update is likely to attract more attention and engagement from teens on the platform. In support of Breast Cancer Awareness Month, two 360i employees are giving people a chance to show solidarity with the millions of women getting mammograms this month. In launching their #Mamming passion project, creatives Michelle Lamont and Michele Jaret — with support from 360i, Dirty Robber, Schillick and Mass Relevance—are embracing the awkwardness of mammograms to remind folks that millions of lives can be saved through early detection. Through a short video starring some familiar faces such as Erin Daniels from “The L Word,” the team is asking people to snap pictures of themselves “mamming” and share them via Instagram. The video has already amassed 24,283 views on YouTube, along with press coverage in BuzzFeed, Creativity (Ad Age), Mediabistro and more. To learn more about #mamming and the ways you can inspire more women to mam where it counts (at the doctor’s office) check out www.thisismamming.com. Smirnoff vodka wants to be a part of your night out by helping you to capture those unforgettable moments that make it awesome. The Diageo-owned brand has released an app called Mixhibit, which allows friends to compile tweets, Facebook status updates and Instagram photos into a video that can be tailored by adding in a soundtrack, and then shared with friends on various social media platforms. The app allows users to sync their accounts so that they’re able to keep up with regular social media behavior to help inform their personalized videos. In addition to introducing scheduled Tweets, Twitter recently launched a new app for Andriod users that allows them to draw on their pictures before sharing them to the platform, as well as to create an image from scratch. The update, which will directly compete with Snapchat’s illustrated pics, will likely increase the amount of pictures being shared on Twitter, and thus engagement across the platform. 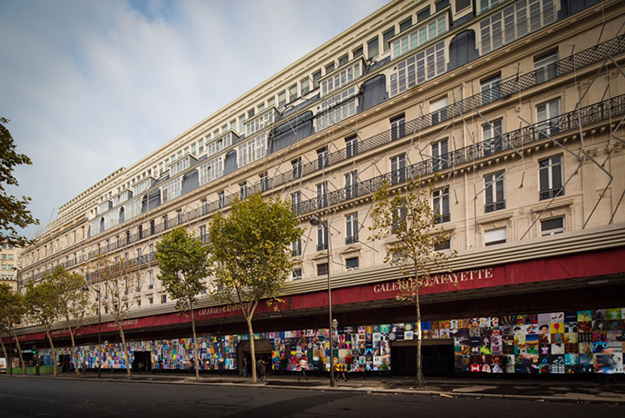 The Galeries Lafayette department store, known for its upmarket French goods, served as the canvas for the latest mission of Diesel’s Reboot campaign. As part of a rebranding effort, Diesel is employing creative thinkers and tastemakers alike as brand ambassadors to help “refresh” Diesel’s branding. As part of the campaign, fans are encouraged to contribute original imagery and artwork that is representative of the current mission via the #DIESELREBOOT Tumblr site – as well as via Twitter, Instagram and Vine. Out of thousands of art submissions from all over the world, 1,000 Tumblr artists were chosen to participate in Mission 4: “Show Me Your Artwork.” The selected art is being displayed on exterior store walls of the department store through next week. VH1 has launched a mobile app where viewers can now watch full episodes of their favorite shows on-the-go. To support the new app, they have created a new content division called VH1 Snack. This new division will focus on creating short-form content that will be released directly from the app, and which will feature bonus content such as live streams, bonus clips and more to help leverage current and past TV content. Lacking the beloved TV viewer experience of flipping through channels, the digital shorts are intended to fill this need and parallel that experience. The app’s content will only be available for current cable subscribers, and unlike apps like Netflix, it will complement fans’ TV watching habits rather than replace them.